Venetian Resort Hotel Casino in Las Vegas, Nevada has a 120,000 square foot casino gambling floor, 2,500 slot machines, 185 table games, race and sport book, poker and luxury hotel with spa. We have been to the Venetian many times and still stand in awe as we walk through the doors. Its a recreation of Venice complete with indoor gondoliers and canal. This is one of best five star resorts on the strip and a place you must visit. 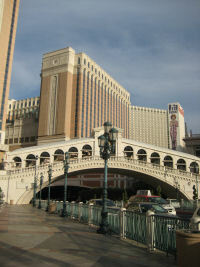 The Venetian is connected to the Palazzo Resort Casino. Table games: 185 tables playing all the popular games. Poker: Huge and posh 63 table poker room playing a variety of games. Sportsbook: The Venetian features a state-of-the-art race and sports lounge where you can relax, wager on and watch all of your favorite sports or races. This is a five star resort, so the rooms are what you would expect, absolutely stunning. 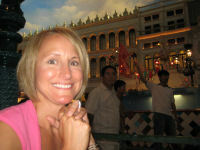 The Venetian Resort-Hotel-Casino is an "all-suite hotel" located on the world-famous Las Vegas Strip. There's nothing “standard” about their standard suites: with an average of 700 square feet of pure luxury, it's approximately twice the size of the typical Las Vegas room. The Venetian offers guests three levels of suite accommodations to suit every taste and style, including the Venezia hotel tower. For a truly unique experience you must take a gondola ride down the Grand Canal. 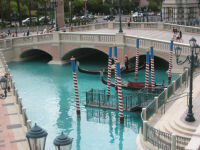 Your singing gondolier will entertain you while you absorb the Venetian streetscape. This romantic ride is an experience you will never forget.